The world of Hindustani Classical Music comprises of Geniuses, both vocalist and instrumentalists. Their music emanates a divine spark. Be it their first recording or a phase of experimentation or perhaps a time when they reached a crescendo in their careers, each of these is a slice of history. And we at Saregama are proud custodians of these immortal moments. Padmabhushan Dr. Basavraj Rajguru, the legendary Classical Vocalist was born in Yeliwal a village in district Dharwad, Karnataka. He was gifted with a melodious voice spanning a range of 4 octaves. His converts and recordings with HMV made him a very popular artiste of his times. Stalwarts like Gaanyogi Pt. Panchakshari Gavayi, Pt. Sureshbabu Mane, Pt. Sawai Gandharva and Pt. Neelkanthbuva have been his guiding forces. In his musical pursuit he imbibed various styles from the Kirana, Gwalior and Patiala Gharanas. His unique presentation led to the creation of the Rajaguru Parampara. Besides being the recipient of the prestigious Padmashree and the Padmabhushan, other laurels such as the Sangeet-Ratna, Swarasamrat, Sangeet Sudhakar, Gaangandharva, Sangeet Natak Academy and a Doctrate were also bestowed upon him. As a guru in the field of classical vocal he left behind a galaxy of disciples such as Somnath Mardur, Ganpati Bhat, Parmeshar, Shreepad and Shantaram Hegde, Muddumohan, Sangeeta Katti, Maheshkumar, Hanumant Dore and Shivanand Patil. He established the Rajguru Sangeet Sabha in Dharwad, now run by his wife Bharatidevi and son Nijguna Rajguru. The Government has established a National Trust in his memory under the aegis of which musical activities will be conducted. These activities include the running of a music college, a museum and an annual music festival. 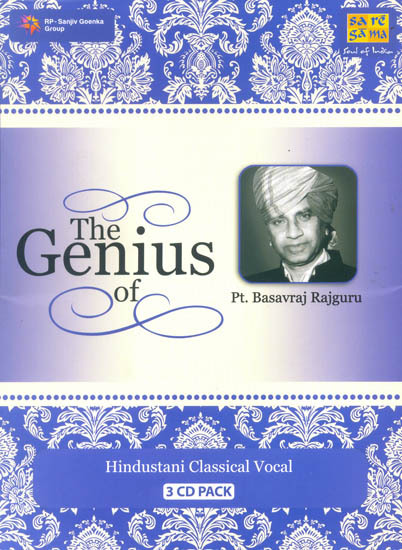 Dr. Basavrajji?s music continues to stay alive through his disciples. This three CD-pack comprises the best of Pt Basavraj Rajguru from Live Concert Recordings, thus justifying the series ?The Genius of.? CD 1 consists of five Ragas. The album opens with two morning melodies in Raga Bhupali Todi and Raga Bilaskhani Todi followed by an afternoon raga Shuddha Sarang. The maestro has presented an interesting Ashta Raga Malika. The album concludes with a Thumri in Raga Bhairavi. CD 2 opens with two morning melodies in Raga Bhatiyar and Raga Alahaiya Bilawal. The third selection is a rare morning Raga Jogia Asawari followed by a presentation in Raga Khambavati. The album concludes with the popular Raga Malkauns. CD 3 opens with the afternoon raga Patdeep. The next two ragas are night melodies, namely, Raga Gorakh Kalyan and the concluding seasonal Raga Basant. All three CDs are live recordings from concerts.